The Aztex Equipment Liftwell Screen is designed for the specific purpose of safeguarding persons working in or around liftwell openings. 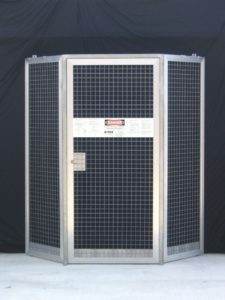 NEVER modify or tamper with the enclosure for any other purpose!Access to Liftwell Screens should be by key and only authorised personnel should be issued with one. DO NOT chock or leave doors open at any time! Don’t forget that even though the new Aztex Liftwell Screens are 40% lighter than the old all steel enclosures, material handling equipment should be used to move them. If they must be manually handled, be sure to use two person lifting techniques. More tips on the Aztex Liftwell Screens to come…For sale and hire details click here.